UMI's Corner Max front end kit is a complete corner carving, autocross and road race solution for the 4th Gen platform. Corner Max products optimize contact patch with a combination of increased caster and roll center height optimization, along with camber gain and bump steer improvements. This kit features UMI Afco rebound adjustable monotube shocks designed by multi-time SCCA Solo champion Sam Strano. The kit includes caster corrected boxed lower arms as well as adjustable tubular upper a-arms. Together, these arms can achieve up to 9 degrees caster while maintaing factory wheelbase. Also included are bolt-in upper mounts to take the place of the corrosion-prone factory mounts and permit roll center height and camber gain adjustment. The UMI twin tube k-member is optimized with a raised roll center height to provide crisp slalom response and less body roll. 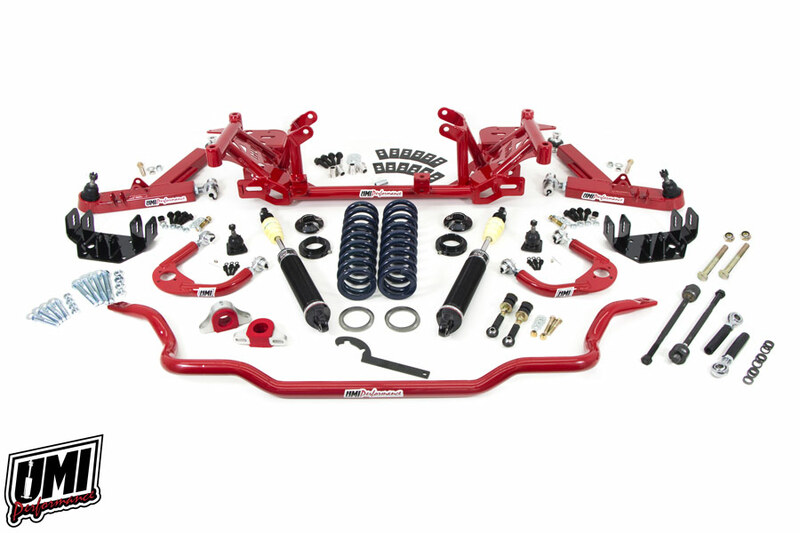 A race proven heavy-duty bump steer kit and UMI's popular 35mm tubular sway bar rounds out the package. Expect the UMI Corner Max system to dramatically improve cornering performance while still providing a crisp daily drive-worthy experience. Kit is perfect for auto-x and track day cars also used for street corner carving or daily driving. Kit includes Strano tuned rebound adjustable monotube shocks built in USA by Afco as well as Made In USA 850lb Hypercoils. K-member features UMI's exclusive roll center optimization and instantly trims 25 lbs off the front of the car. A-arm geometry adds caster without affecting wheelbase. Upper a-arm mount features three pickup point choices to further optimize roll center and camber gain. UMI light weight tubular 2112 sway bar included (35mm). Heavy duty bump steer kit built specifically for racing use (requires spindle drilling).